Hey there, forex friends! In case you missed it, the Fed finally pushed through with another long-awaited rate hike after an entire year. The rate hike itself was widely expected, however, because of recent developments in the U.S. economy, as well as hints that the Fed was worried about its credibility, as revealed by the minutes of the November FOMC meeting. So, what happened during the December FOMC statement? And why did it trigger such a move from the Greenback? Well, here are four key takeaways that you should know about! After an entire year of sitting on their hands, Fed officials voted to raise the federal funds rate by 25 bps to a new target range of 0.50% to 0.75%. Finally! Not only that, the vote to hike was unanimous, as you can see below. In short,”some” Fed officials may have been convinced to join the rate hike bandwagon by the Trump Effect. The rate hike was actually widely expected, so forex traders were mostly focused on the future direction of monetary policy. Having said that, the Fed upgraded its rate hike projections, as you can see below. Okay, let’s break it down. The Fed upgraded its fed funds rate projection for 2017, with the median path now at 1.4%, up from 1.1% previously. And using the top of the new target range, which is 0.75%, as the starting point, that means the Fed thinks there’s room for 2-3 25 bps rate hikes in 2017, up from 1-2 hikes. The extra rate hike in 2017 also pushed up the path of monetary policy in 2018 and 2019. The median expectation for the fed funds rate is now expected be at 2.1% in 2018, up from 1.9%. This means 5-6 rate hikes, up from 4-5. Projections for 2019, meanwhile, is that the fed funds rate would be at 2.9%, up from 2.6%. This implies room for 8-9 hikes, up from 7-8. 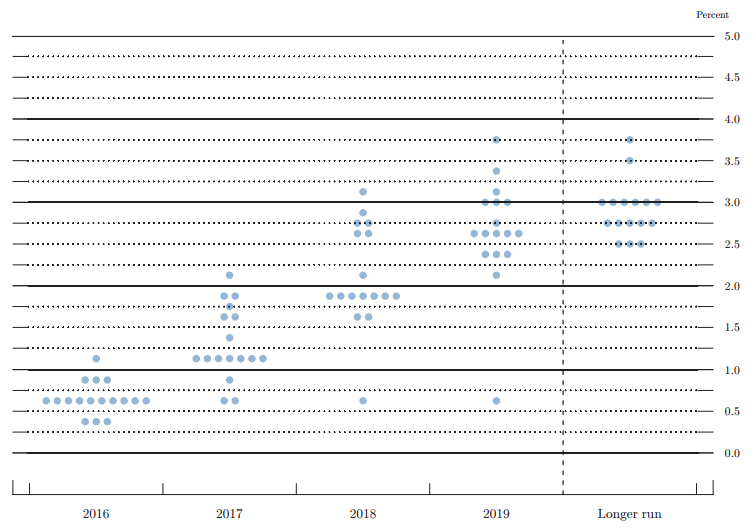 The Fed’s dot plot is even more interesting, as you can see below. If those dots don’t make sense to ya, then let me try and break it down. 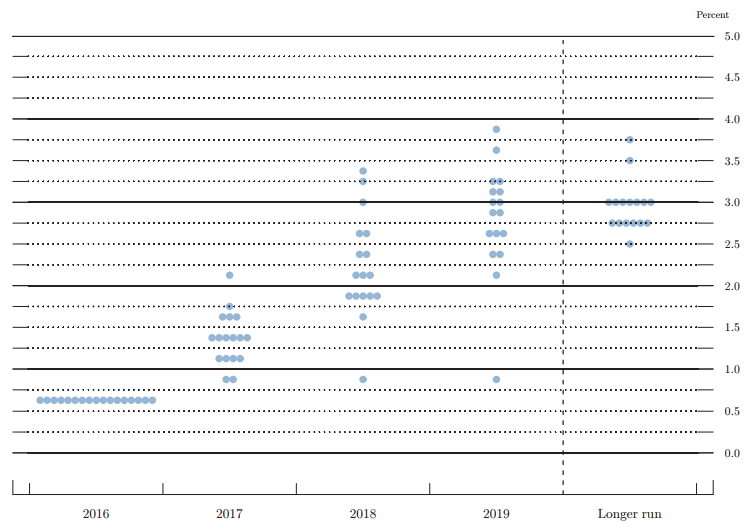 Looking at the December dot plot, we can see that ALL FOMC members, even the non-voting ones, agreed to raising the fed funds rate above 0.50%, so the rate hike was really unanimous. Moving onward to 2017, we can see that all FOMC members, voting and non-voting alike, agree that the fed funds rate should be above 0.75% by the end of 2017, with two FOMC members open to only one further rate hike while four FOMC members think the fed funds rate should be at 1.125%, which implies that they would agree to two hikes at most. The rest, who form the majority, are open to more than two hikes in 2017. The hawkish stuff doesn’t end with the Fed’s upgraded rate hike projections, because the Fed is also forecasting good times ahead for the U.S. economy. Regarding growth, the Fed slightly upgraded its GDP growth projections for 2016 from 1.8% to 1.9%. The same is true for 2017 (2.1% vs. 2.0% previous) and 2019 (1.9% vs. 1.8% previous) while 2018 was unchanged at a solid 2.0%. Moving to the labor market, the Fed expected the jobless rate to be at 4.7% by the end of the year, which is a tick higher than November’s 4.6% reading, but better than the Fed’s earlier forecast of 4.7%. The Fed then expects the jobless rate to drop to 4.5% and hold steady there until 2019, which is better than its September projections that the jobless rate would be at 4.6% by the end of 2017, improve to 4.5% in 2018, before ticking back up to 4.6%. Yellen did acknowledge the downward trend in the labor force participation rate, but she tried to give it a more upbeat spin by saying that it stems “largely from the aging of the U.S. population” rather than lack of job opportunities, as implied by the large number of low-wage jobs and part-time jobholders. 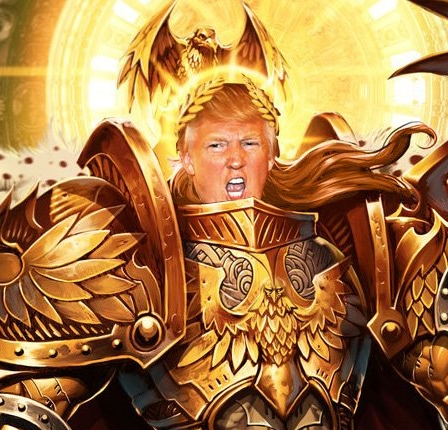 It’s gonna be yuuuuge! Believe me! As I noted earlier, the Trump Effect may have tipped the balance for “some” Fed officials to join the rate hike camp. And during the Q&A portion, Yellen was pressed on this issue. One reporter asked Yellen about a possible scenario in which fiscal policy is introduced, but it does not result in higher productive capacity. The question to Yellen and the Fed, therefore, is if they would respond by hiking even faster. In short, Yellen used some Matrix-like evasive maneuvers to dodge the question. The journalists apparently wanted clarity, however, and so one of them blatantly asked Yellen just how much fiscal stimulus the economy can take before the risk of overheating grows. In summary, fiscal stimulus is not needed at this point, which implies a chance that the economy may overheat should Trump push through with his plans. 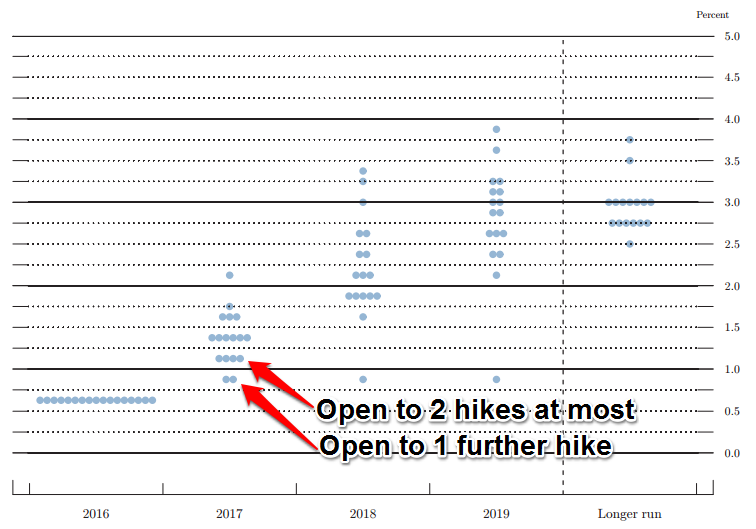 Whether that would then prompt the Fed to hike faster than projected wasn’t answered, but Yellen’s refusal to give a straight answer does seem to imply that the Fed would respond by hiking faster. Sweet! 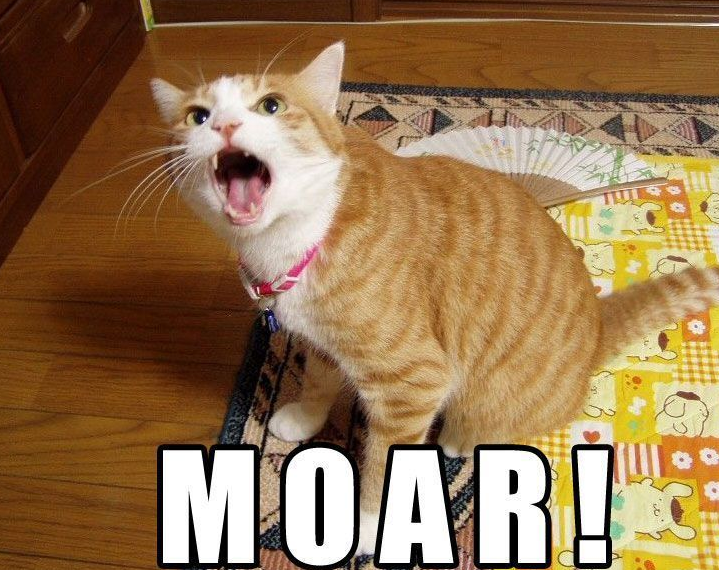 Potentially even moar rate hikes! Again, the December rate hike was widely anticipated. However, the extra rate hike in 2017 was not, so the market was likely pricing that in. Also, the market probably wasn’t expecting Yellen’s reply about additional fiscal stimulus possibly resulting to an overheating U.S. economy, as well as hints that the Fed may hike faster than projected as a response. 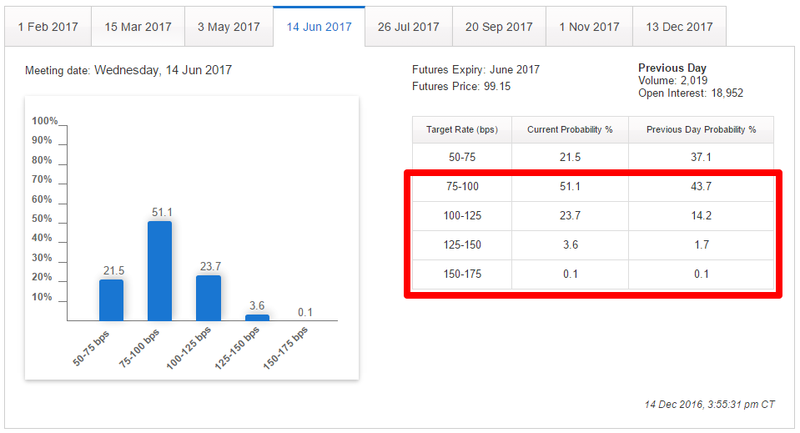 As to when the next rate hike will likely be, the CME Group’s FedWatch Tool indicates a 78.5% probability of a rate hike by the June 2017 FOMC meeting. Before that, the probability of a further rate hike is less than 50%. So, now that the Fed has finally delivered on a rate hike this year, do you believe that we’ll be getting 2-3 rate hikes next year? Share your thoughts by voting in the poll below. Keep in mind that the Fed originally projected 3-4 rate hikes in December 2015, then downgraded that to 2-3 during the March FOMC statement before downgrading it further to 1-2 and then one (or none at all) during the June and September FOMC meetings respectively. But as noted in this write-up, there’s a new factor that just wasn’t there before – Trump.